I have given advice on how to make select teams. I have given advice on how to make a travel or select baseball team and on how to make a select or travel soccer team. Much of the advice for making a soccer team is valid for basketball. I have listed the relevant points below, see the soccer advice post for the details. 1) Get to the tryout early and show off your skills. 2) Wear something that will standout in a crowd. 3) Stand out with individual moves. 4) Take advantage of water breaks to stand out during the tryouts. 5) Make sure your kid works very hard when the evaluators are looking and conserves energy when they are not. 6) Introduce yourself to the head evaluator after the tryout. 7) Go to all the tryouts even if they say only one is required. My daughter wanted to play for one of the top select basketball programs in the metro area. Her best friend played for the organization in the winter of 09/10 and was trying out again. The tryouts were scheduled for September 25th and Oct 2nd. My daughter, CC, violated rule #7 above. She could not go to the first tryout because she had 10 girls scheduled to celebrate her birthday with her on that date at that time. Her best friend went to the tryout and showed up at the party late. This obviously was not an ideal situation. It demonstrated a lack of commitment and limited the amount of looks my daughter would get. We planned to go to the second tryout on October 2 at 5:30. Unfortunately, CC had a soccer game scheduled from 4:30 to 5:30 in the next state over. The soccer field was 45 minutes from the tryout gym. CC wanted to skip the soccer game, but I told her that that was not an option. She made a commitment to her soccer team and she needed to honor it. CC scored a goal and her team won 3-2 against the top team in the league, so it was a good decision. I had called the coach of the basketball team to explain our predicament. I asked her if it would be possible to hold a private tryout. The coach informed me that about 30 very talented girls were participating in the tryout process and she believed that she would be able to form a solid team from this group. The short answer, no. She did ask me about my daughter. I told her which teams she played on and described her style of play. CC had played against the coach's team during summer league. The coach told me that she knew exactly who my daughter was and encouraged me to get my daughter to the last 30 minutes of the final tryout. Luckily, rain poured down on the soccer field and the refs decided to start the game early and reduce the amount of time between halves. As a result, the game ended fifteen minutes earlier than projected and we were able to make the last 50 minutes of the basketball tryout. Still a violation of rule #1 but better than we had expected. I guess that is all CC needed to impress the coaching staff because she got an offer to play on the team the very next night. My daughter was thrilled. Her new basketball team is a year round commitment, winter, spring and summer with lots of travel. Before we accepted the offer, we made our daughter choose between select basketball and softball. (She will continue to play select soccer.) 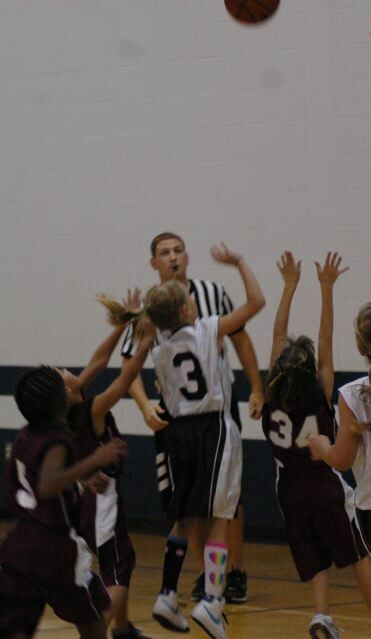 He understood that she would need to drop softball to play basketball on this team. It was an easy decision. She wants to hoop it up all year round now. I believe that the advice I give to parents to help their kids standout at tryouts is valid, but at the end of the day, talent is what will separate your kid from the others. To select for a basketball team, we need to show our talent, skills, and efforts. Players those are having unique basketball techniques are easily selected for the team. Techniques that include, basketball dribbling, passes, shooting, and many others. Youth Sports: How Do Single Parents Do It?